Quick and easy breakfast egg scramble. Sausage, Rice and Egg Scramble with spinach and tomatoes. Healthy, gluten free and protein rich breakfast. Usually my schedule is pretty full. Between a full-time job, blogging and working out, it’s easy for the day to fly by. Cooking and enjoying quality meals is something I’m not willing to pass on, so creative cooking is sometimes required. When starting dinner around 7, with lots of work still to do, a fast meal is a must. 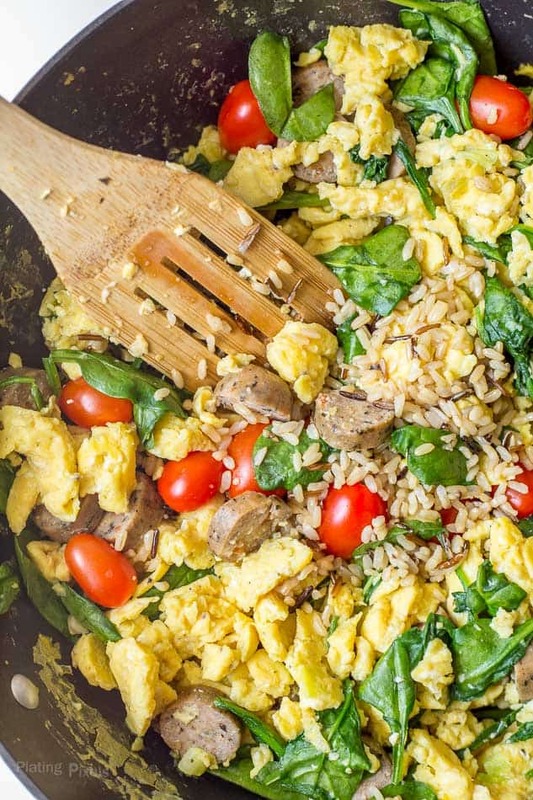 This Spinach, Sausage, Rice and Egg Scramble is ideal for a quick weekday meal for your yourself or family. Whether it’s breakfast or dinner, this meal is easy to make. 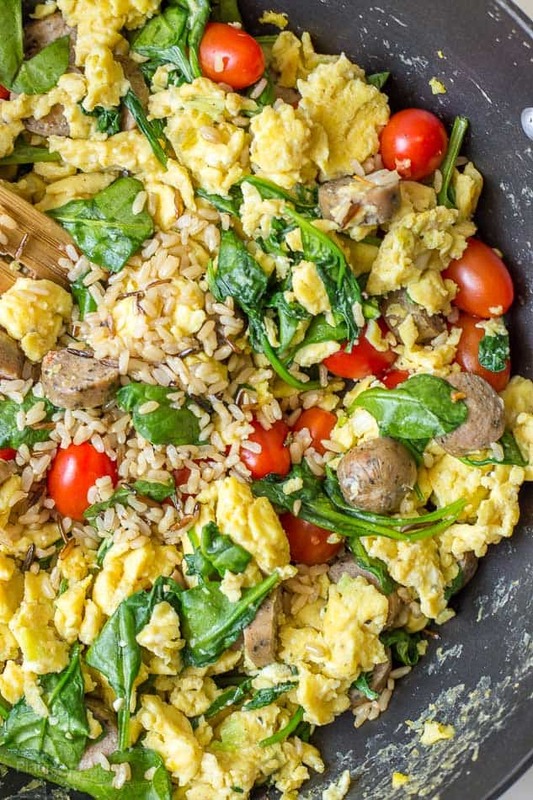 It’s a one pot breakfast scramble made with eggs, sausage, spinach, tomatoes and rice. Moist, fluffy eggs with rich and meaty sausage (I used cooked chicken sausage links to save time) makes a healthy, protein rich scramble. Cooked spinach and tomatoes add fiber and vitamins as well as vibrant color. 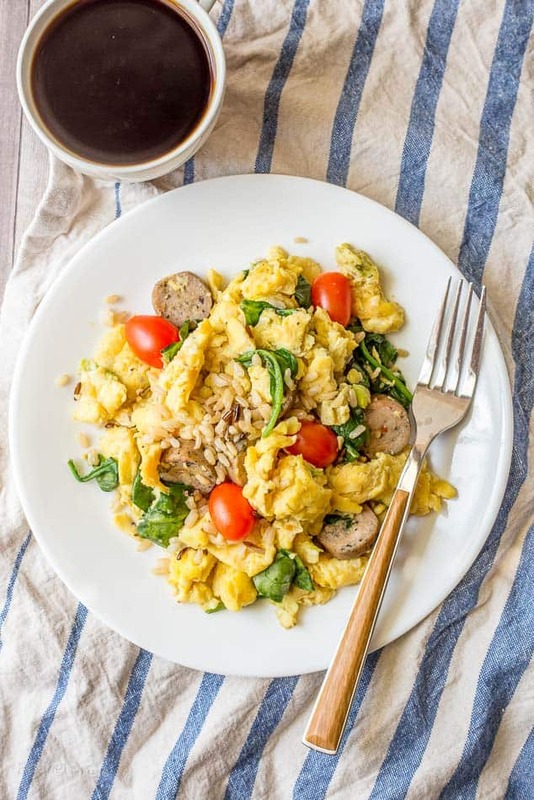 With different rice varieties, it a versatile ingredient that can be enjoyed as a side with protein and veggies, or mixed into a dish like this sausage, rice and egg scramble. Get creative and enjoy rice with entrees, soups, salads, or even dessert, or simply as a side or snack. Flavor profiles: Savory, buttery and meaty. Texture: Fluffy, moist eggs with tender sausage. Dietary Options/Substitutions: This recipe is gluten-free. For vegetarian omit sausage. 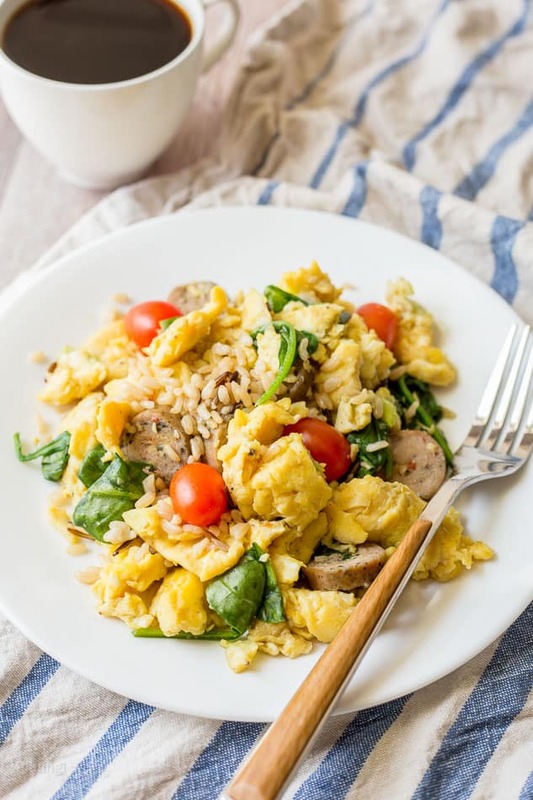 Sausage, Rice and Egg Scramble with spinach and tomatoes makes a healthy, gluten free and protein rich breakfast. Bring lightly salted water to boil in a saucepan. Stir in rice, cover and simmer on low for 45 minutes, or until cooked. Remove lid, fluff with fork and set aside. In a medium bowl whisk together eggs, half and half, green onion, garlic powder, cumin, paprika, salt and pepper. Heat a large non-stick pan to medium heat, lightly grease and add egg mixture. Cook, stirring and folding often, until fluffy and mostly cooked; about 5 minutes. Stir in sausage, spinach and tomatoes. Reduce heat to medium-low, cover and cook until spinach is wilted and sausage is heated. Stir cooked rice into egg scramble and serve immediately. Hi Jagruti. You totally could! Or even omit and add in more variety of veggies like bell pepper. Love breakfast scrambles! This look so healthy. It sure is! Thanks Evi! Nothing beats a good egg scramble for breakfast. I usually make mine with leftovers, but the rice would be an interesting addition I’ve never tried before! Lovely colors. This looks so beautiful and delicious! That’s how my perfect breakfast looks like. I am surely making this sooner or later! Hi Serena. You could definitely modify it and like the creativity there! I agree the rice can stay in. Thanks!